Okagbare could win $50,000 with Zurich Diamond League VICTORY, while Usain Bolt ends his 2014 season early! Next stop…Zurich. Fans of Nigeria’s No.1 sprinting sensation, Blessing Okagbare will have to wait no more as the athlete resumes action at the IAAF Diamond League on Thursday, August 28 in Zurich, Switzerland where she will compete in the 100m in a STACKED field that includes Veronica Campbell-Brown (SB 10.86s), Murielle Ahouré (10.97s) and Allyson Felix (11.01s) amongst others. Okagbare took a break from the prestigious series to compete in her first Commonwealth Games in Glasgow (July 23 to August 3) where she claimed the 100/200m sprint double. In the 100m, she breasted the tape in the 100m with a Season’s Best (SB) and Championship Record (CR) of 10.85s, denying former world champion, Campbell-Brown a much sought after victory in the event. The Jamaican is yet to win an individual title at the Commonwealth Games, having won two silver medals in the 100m (2002 and 2014) and another in the 200m (2006). The Nigerian maintained her stellar performance this season by reclaiming her African title in the 100m at the African Senior Championships in Marrakech where she stormed to the crown with a CR of 11.00s flat, also denying fierce rival, Ahouré of Cote d’Ivoire her first African title in the event. Okagbare however pulled out of the 200m, which Ahouré dominated easily with a time of 22.36s. Dafne Schippers of the Netherlands will be looking to go under 11 seconds for the first time. The Dutchwoman sneaked in a win in the 200m at the Glasgow leg of the series where she stunned Felix (22.35s) and Okagbare (22.41s) to win the title with a National Record (NR) of 22.34s – she has since lowered the Dutch NR to a world leading 22.03s this season at the European Championships! Her 100m PB of 11.03s set in the B race of the Glasgow Diamond League 100m is also a National Record – not bad for a heptathlete! This race is only Okagbare’s fourth 100m in the Diamond League this year, and she is yet to secure a victory in the event. She finished second behind Shelly-Ann Fraser-Pryce in the very first meeting in Doha, but didn’t finish her race in Lausanne after she slipped. She placed fourth in Monaco behind Bowie, Campbell-Brown and Ahoure. She occupies a distant sixth place in the standings with just 2 Diamond League points while Tori Bowie sits at the top with 12 points. However Bowie, who has the world leading time of 10.80s this season, will be the only big name missing. She has had to withdraw after pulling up injured in the 100m in the Birmingham Diamond League meet at the weekend. 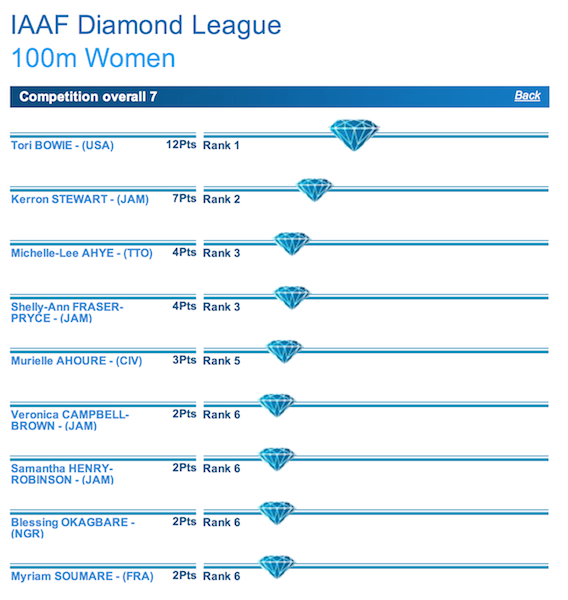 The most fascinating aspect of the IAAF Diamond League, are the double points awarded in the final race of each event, with 16 Diamond Races being decided in Zurich, and the final 16 being decided in Brussels next week! This annual twist in events adds to the excitement of the final races, as an athlete currently ranking in third or fourth place, could change their fortunes just by winning the final race. So while a few races are practically over, in many other races, the athletes will battle till the very last second or centimetre! The rules also state that one must compete in the final race of their event to win the Diamond Race crown, so despite having amassed a near unassailable lead, Bowie’s absence blows the 200m Diamond Race right open, and means that in a dramatic twist of fate, Okagbare could win her FIRST ever Diamond League crown with a WIN, so long as Kerron Stewart, who currently occupies 2nd place in the Race with 7 points, does not finish as the runner-up in Zurich! Standings before FINAL race (Zurich). Diamond League competitors get 4 points for a win,2 points for 2nd place, and 1 point for 3rd, but these points are DOUBLED for the final race! 1st place in each Diamond League event takes home $10,000 and the overall winner for the Diamond Race in each event each season takes home $40,000. This means that a $50,000 windfall is at stake for Blessing and her rivals in Zurich – every single woman in the race has a mathematical chance of taking home the 200m Diamond Race Crown! Meanwhile, $50,000 is small change for the likes of Usain Bolt, so he does not compete regularly in the Diamond League, instead prioritising meets that can afford the appearance fees he commands – anywhere from $250,000 per race, up to $500,000 which he received for the London Anniversary Games last year! He has pulled out of the Zurich meet, bringing an early end to his 2014 campaign. Zurich was meant to be the last competition for the Jamaican multiple world and Olympic champion, who clocked 9.98s in Warsaw on Saturday night to set an unofficial 100m indoor record, previously held by Frankie Fredericks in 10.05s – the 100m is never run indoors, but prior to the race Bolt cheekily asked for the stadium roof to be closed to claim the unofficial record! It was only Bolt’s second individual and fourth race of an injury-hampered season. His other two outings were at the Commonwealth Games where he made his debut by anchoring the 4x100m team to gold with a CR of 37.58s. It would have been fun to watch Bolt re-ignite his rivalry with former world champion, Tyson Gay (9.93s) of the US who would be attempting the sprint double in Zurich. Nevertheless, the 100m still promises to be exciting, as Gay’s fellow returnee Asafa Powell, who returned a stunning SB of 9.87s a few days ago in Austin, and newly crowned European 100m & 200m Champions, James Dasaolu and Adam Gemili will also be on show! The Zurich Diamond League will be shown LIVE on SuperSports 2 from 7-9pm on Thursday, with Blessing’s 100m race at 7.59pm SHARP! YOU DON’T WANT TO MISS THIS! ← Blessing Okagbare EXCLUSIVE Part III – On the Olympic Treble & On Reviving Nigerian Athletics!